We’d love your help. Let us know what’s wrong with this preview of The Chia Letters by Michelle Noteboom. Letters in chapbook envelope; Dusie pressmark as stamp. Jared Hayes, Cara Benson, Amy King, Emma Phillipps, Arielle Guy, Jane Sprague, Ana Bozicevic, Anna Moschovakis, Kaia Sand, Anna Fulford, Samar Abulhassan, Mackenzie Carignan, Zoe Skoulding, Catherine Letters in chapbook envelope; Dusie pressmark as stamp. To ask other readers questions about The Chia Letters, please sign up. 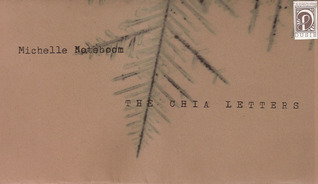 "The Chia Letters" is a one-way correspondence by L. addressed to Chia, an entity which sounds like a god or a supercomputer. "As I write, the bees are beginning to swarm," one of the letters says. The tone of each succeeding letter becomes more desperate than the one before it. In the end, L. realizes that: "Our bodies are becoming a new kind of language." Entertaining and deliciously steampunky!